A deadly warehouse fire in Oakland, Calif., is a symptom of the larger housing crisis, housing advocates say. The fire, which killed at least 36 people at a dance party Friday night, broke out in an Oakland warehouse known as the Ghost Ship. The warehouse “supported underground artists and provided makeshift residences for people priced out of rapidly gentrifying Bay Area cities,” according to a news release. However, the building lacked basic fire safety protections – and when fire engulfed the building Friday night, the main escape path from the building was quickly blocked. 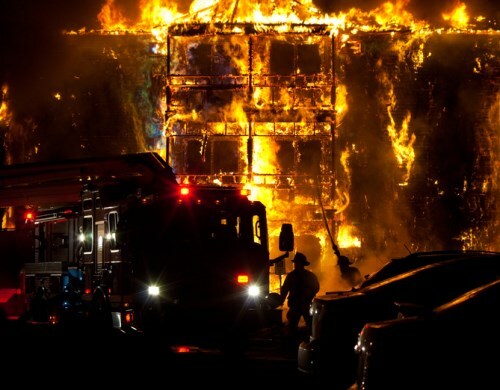 The blaze may be the deadliest structure fire in Oakland history, according to Commondreams.org. Housing advocates place the blame for the death toll on a lack of affordable housing in the Bay Area. The tech boom has turned San Francisco into one of the world’s most expensive cities, and advocates say that marginalized and low-income residents have been forced to live in increasingly unsafe places. What do you think? Can the Bay Area’s affordable housing crunch be blamed at all for the death toll? Let us know your thoughts in the comments below.